The following is a list of some of the main organic (not all certified - ask them) locally-sourced box schemes serving London. Some are run as social enterprises so offer affordable veg, and some accept Healthy Start vouchers or discounts to pensioners so make sure you ask! If possible, try to use the box scheme that is closest to you to support your local community. Growing Communities are leaders in the local food movement; running a box scheme, food growing gardens and a new starter farm in Dagenham, as well as the only certified organic farmer’s market in London. They operate a pick-up scheme rather than a delivery one. This keeps pollution costs and food miles down as well as encouraging a sense of community. Salad leaves for the box scheme are grown in gardens in parks in the area, where the public can volunteer to learn more about growing. Location: 10 pick-up points throughout Hackney. Day: Wednesday or Thursday, depending on the pick-up point. Set up as a not-for-profit weekly veg box scheme, Local Greens followed the Growing Communities model, going through its start-up programme. Location: South East London, with collection points throughout Camberwelll, Dulwich, East Dulwich, West Dulwich, Brixton, Herne Hill. VegBox are also graduates of the Growing Communities start-up programme and are committed to providing affordable local veg from small-scale organic growers. Location: 4 pick-up points in Kentish Town/Camden area. Capricorn Organics vary their boxes regularly and tailor them to suit each individual customer’s preferences. They deliver, so are a good option for those busy people who are unable to collect veg boxes but who still want to buy seasonal and organic produce. Location: Delivers to most parts of Southeast London and Bexley Borough. Another graduate from Growing Communities Start-Up programme based in Haringey. The not-for-profit organisation wants lots of local people to be involved in the running of the scheme, so if you’re living locally then check out their “Get Involved” page to see how! 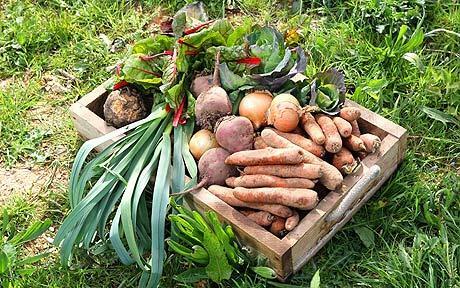 The organic food shop, Earth Natural Foods, on Kentish Town Road has now introduced an Organic Vegetable Box Delivery Scheme for those in North London. This box scheme started in November 2013 and is also part of the Growing Communities Start-Up programme. They have a “swap box” at one of their pick-up points where you can exchange any veg you don’t want with others in the scheme. Location: Pick-up points throughout Enfield. This co-operative Veg Bag scheme works in partnership with its suppliers, Co-operatives UK, Growing Communities, The Plunkett Foundation and Transition Town Kensal to Kilburn to supply affordable organic and local food to the community. Location: North West London, with pick-up points in Cricklewood, Kilburn, Kensal Green, Willesden Green, Queen’s Park, West Hampstead, and Portobello. This box scheme delivers for free on all its set boxes in the evening. Organiclea is a community food project based in the Lea Valley in north-east London. They produce and distribute food and plants locally, and support others to do the same through a variety of training opportunities. Location: A range of pick-up points across Waltham Forest. Day: Any time from Wednesday evening until Saturday. Tel: 08452 62 62 62. This scheme has been running since 1995. Although local and organic vegetables, fruits, and herbs are what they specialise in, they also sell a large range of wholefoods, special dietary foods, and refillable eco-cleaning products too. Set up in 1994 as a way of promoting organic food for one’s health and for the environment, London’s first organic box scheme still runs today. Check on the website to see if it delivers to your area. Location: Delivers to Greater London.